Do you know how to build a storage shed? Building a storage house is easy when you have a plan and basic carpentry skills; there’s no need to worry because storage shed materials are available in DIY stores. A big household with several kids running and playing around is fun but keeping the house clean and orderly is always Mom and Dad’s problem. Over the years, parents have accumulated a lot of toys for the little ones. Some families like to keep old furniture and appliances for their sentimental value and stuff them into the garage. Sooner or later, there’s a need to get rid of these things or pile them somewhere else. That’s when you need to build a storage shed. If you think storage shed is simply a place to store whatever surplus you want to keep; then think again. A storage shed, literally, is a place to store gardening and carpentry tools, gardening and pool maintenance equipment, firewood, outdoor furniture, painting and decorating supplies and tools including bikes and skating boards. Storage shed saves you space inside the house. If you want a place for your hobbies, then storage shed can be a perfect place to cultivate your talent and develop craftsmanship. Potted plants can be kept in storage shed even in winter time. If you are inclined to carpentry, you can use the storage shed as your carpentry shop and no one will complain of your noise. 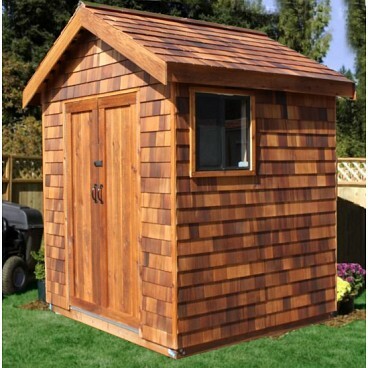 Cost of storage sheds depends on the quality of materials, size and the style or appearance. Prices may be as low as US$200 but can also be as expensive as US$6000. Before you start building a storage shed, you must first get a building permit from your local authority and you might also be required to submit your storage shed plan for approval. After getting your building approval, you can prepare the materials needed such as plywood, OSB sheets, decking, posts and boards, cinderblocks, siding, nails, screws, paint, primer and roofing. These are available in many DIY storage shed outlets. Aside from wooden storage sheds, there’s vinyl, plastic or metal material to choose from. Check online for the best deal you can get on storage shed. You will also need tools to start the carpentry work such as saw, nailer, screw gun, paintbrushes, paint roller, framing square, measuring tape, shovel, pencil, level, nail gun, work gloves and safety glasses. How to build a storage shed can be easy if you follow the step-by-step procedure. It begins with the construction of the frame, followed by the deck. Then build the walls around, and fortify the frames. Add the roofing, then the windows and the sidings. Finally, do the final touch to your storage shed.